​Nearly half of all American families regularly skip breakfast. Is your family one of them? When it comes to getting your children to school, a healthy breakfast is just as important as gym shoes and sharp pencils. It’s easy to see how breakfast has come to qualify as one of the nutritional challenges of parenthood. Whether it’s your own parental time constraints or your child’s busy schedule, getting the whole family ready to set off to child care and/or school in the morning, play dates, or any of a whole host of other common early-in-the-day commitments, breakfast is often neglected. If the words “slow” and “leisurely” don’t exactly describe your morning routine, we’d like to suggest that you commit a little extra time and effort to protecting the nutritional integrity of your child’s morning meal. Whether you opt for a simple breakfast or a more elaborate one, any effort to make it nutritious is better than no breakfast at all. Whether that means a glass of low-fat milk and a piece of wheat toast or an all-out feast, the following breakfast-made-easier tips will hopefully help you rise to the occasion and overcome some of the most common barriers to a healthy breakfast. Schedule accordingly. While we’d like to remind you that sitting down and sharing family meals is beneficial, we’re willing to bet that sitting down to a leisurely breakfast with your kids each morning simply isn’t realistic for most of you. What is realistic, however, is making sure you carve out enough time to allow your child to eat without pressure. Especially for infants and toddlers, this includes factoring in enough time in the morning’s schedule to allow for both assisted- and self-feeding. Fix breakfast before bedtime. In other words, plan ahead. As with just about all other aspects of feeding your child, a little advance planning can go a long way toward having a wider range of healthy foods on hand. Simple examples such as hard-boiling eggs ahead of time or having your child’s favorite cold cereal dished out the night before to pair with some presliced fresh fruit can mean the difference between time for a balanced breakfast and running out the door without it (or, as is often the case, with some commercially packaged and far less nutritious alternative in hand). Grab-and-go breakfasts. If the reality of your schedule is such that you and your kids routinely run out the door with no time to spare in the morning, then try stocking up on a variety of nutritious foods that you can prepare and prepackage for healthier grab-and-go convenience. In addition to hard-boiled eggs, consider other fast favorites like sliced apples, yogurt, homemade muffins, or a bagel with low-fat cream cheese. Make sure sleep is on the menu. Applying the age-old adage, make sure your child is early enough to bed that she rises early enough to allow time for breakfast. No matter what their age, tired kids tend to be cranky, and cranky kids are far less likely to sit down for a well-balanced breakfast. Not only that, but sleep has proven itself to be a crucial ingredient in children’s overall health. Broaden your horizons. You’ll certainly want to keep safety in mind when figuring out what’s age-appropriate to offer your child for breakfast, but don’t let yourself be constrained by artificially imposed labels to determine what is good to serve for a morning meal. Think protein, think fruits and vegetables, and think outside the box when it comes to expanding your breakfast horizons beyond just breakfast cereals and milk. Look for child care and school support. 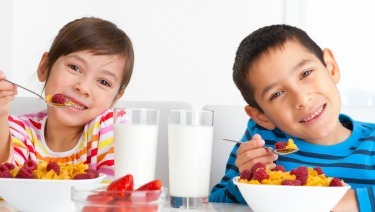 Be sure to check out what breakfast options your child’s school or child care provider offers. With much-deserved attention now being paid to the food our children eat in out-of-home settings, you’re more likely to find balanced breakfast options on the menu, and your child may well be more receptive to eating them if all of his friends are eating alongside him.